The only positive thing I can say about the experience is that I walked away understanding the appeal of the source material. There are enough engaging and inventive concepts on display here that I see exactly why filmmakers have so long been attracted to the story. 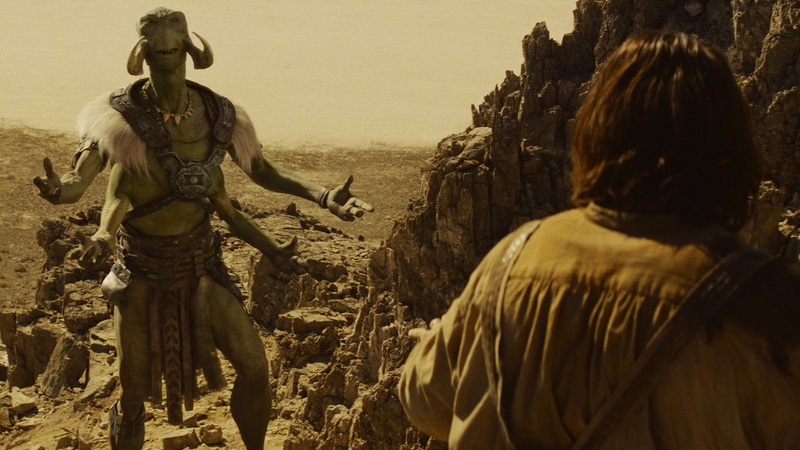 When you strip “John Carter” down to its most basic components, it sounds wonderful: the title character is a Confederate veteran who is mysteriously transported to Mars while searching for gold in Arizona. On Mars, the low gravity gives him superhuman strength and agility, and he befriends a green, six-limbed alien species called the Tharks. He soon discovers that Mars – called Barsoom by its inhabitants – is in the midst of a brutal civil war between two humanoid civilizations, with the Tharks caught in between. Carter meets the beautiful princess of the war-torn city of Helium, and together they set off on an adventure to restore peace to the planet. The story has all the ingredients for thrilling sci-fi storytelling; there’s no doubt about that. 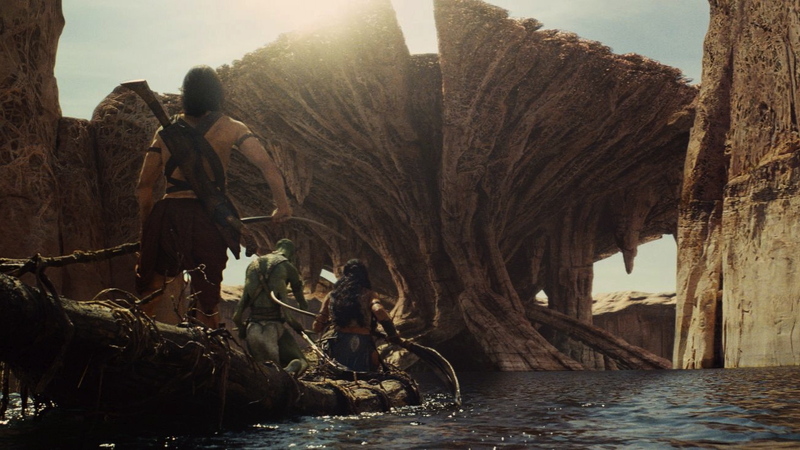 It just seems to me that no one involved in the project – and “John Carter” has been in development for a long time – had any clear sense of how best to bring this story to the screen. There’s a fun, B-movie swashbuckler tone present early on, but once Carter arrives on Mars, the script starts taking certain characters and bits of the mythology very seriously; already, we have two clashing tones. Then there are copious amounts of comic relief, none of it organic, and more importantly, none of it funny; and we mustn’t forget about the romance, half-baked and stale. In short, “John Carter” doesn’t know what it wants to be. I think there were two clear directions to choose from: campy and fun, or serious and intense, but Stanton and company opted to go with both, and they simply aren’t capable or riding the tricky tonal shifts that come along with such ambition. 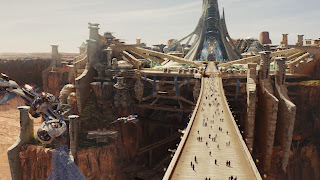 Let me put it this way: when you have bad actors talking about “Tharks” and “Therns” and cities called “Helium” and “Zodanga” and names like “Sola” and “Sab Than” and “Dejah,” a barely-developed sub-plot about John Carter grieving over the violent immolation of his wife and child sticks out like a sore thumb. It doesn’t help that the story, relatively simple on paper, becomes needlessly complex and endlessly convoluted in execution. So much of the film is devoted to exposition – another tonal issue, as we are expected to take long conversations about strategic marriage and succession on Mars seriously – and none of it is presented interestingly or clearly. Typically, when exposition is boring, it at least has the common courtesy to make sense. There are many characters, factions, and sub-plots that could be cleanly eliminated without sacrificing one iota of narrative integrity, and from what Wikipedia tells me, most of this extraneous detail isn’t even in the book being adapted. But for me, the single biggest flaw comes in the casting of the title character. Taylor Kitsch is absolutely awful as John Carter. He’s attempting to do the gruff, “badass-with-a-heart-of-gold” Western archetype, and not only does it comes across as forced and insincere, but it’s laughably inept for good chunks of the movie. Most importantly, Carter is a woefully underwritten character, with the script leaving most of his transformative arc up to the actor. Kitsch, however, is only capable of two modes: unrefined, “I-just-want-my-gold” Carter, and polished, “I’m-a-good-and-whole-person-now” Carter. He can’t find any grey space between the two, and as such, any dynamism the character might have had goes out the window. He isn’t charismatic, he isn’t interesting, and he isn’t engaging in the slightest. Kitsch is a giant, life-sucking black hole in the middle of an already bad movie, and that kills just about anything else the film had going for it. An engaging protagonist can cover up a lot of sins; Kitsch only exacerbates them. Swap him out for Josh Holloway – who perfected this type of character as Sawyer on Lost – and my estimation of the movie rises a couple of letter grades. The supporting players aren’t much better. Lynn Collins is dry, boring, and completely detached as Dejah Thoris, Carter’s love interest; she’s a wet-noodle, but we’re supposed to buy her as strong and independent. It just comes across as wooden. Dominic West – who played one of the key characters in the greatest TV show of all time, The Wire – tackles his generic villain role with all the enthusiasm of your standard “I-really-needed-a-paycheck” performance, while Willem Dafoe and Thomas Haden Church fail to leave an impression in their voice roles. The only actor who makes anything out of the material is Mark Strong as the story’s evil mastermind; though it’s a role Strong could – and probably did – do in his sleep, he lends the part a gravitas and credibility the rest of the film desperately needed. I will say this: as Andrew Stanton’s work with Pixar has proven, he is a tremendous visual craftsman, and the same creativity that built sweeping, enveloping foreign worlds in “Finding Nemo” and “WALL-E” is put to good use here. Every Martian landscape, every otherworldly city, and every bit of technology or architecture feels completely real, and is simply awe-inspiring to look at. The 15-foot-tall Tharks are a wonder of artistic design and VFX work, while the action sequences have a verve and spontaneity that Stanton’s fellow Pixar auteur Brad Bird would be proud of. All that being said, it’s nearly impossible to enjoy the visuals in the 3D presentation; this is the absolute worst the format has to offer. The depth is wholly inorganic, bearing more resemblance to a pop-up book than to “Avatar,” the picture is woefully dim, and all the detail in the image is blurred. I found it practically unwatchable; if you must see John Carter, opt for the proper 2D version. But it’s not an experience I can recommend in any form. If you’re a big fan of Burroughs’ books, you might get a kick out of the film, but even then, there’s precious little here that I can imagine anyone enjoying. Disney was probably right to bury this one in March and give it an unappealing marketing campaign; it’s better they wash their hands of this one quick and let all involved – at least those with talent – return unscathed to pastures greener.